Habit: Perennial herb from woody caudex or rhizome, branched distally. Leaf: alternate, often sessile, resinous or not. Inflorescence: heads radiate, few to many, in +- flat-topped to panicle-like, often +- 1-sided clusters; involucre cylindric to bell-shaped; phyllaries generally +- graduated in 3--5 series, midrib generally +- swollen, translucent, tip flat or slightly swollen; receptacle slightly convex, honeycombed, ridges uneven, epaleate. Ray Flower: few to many; ray yellow. Disk Flower: few to many; corolla yellow, generally glabrous; anther tip narrowly triangular; style branches finely papillate, tips triangular. Fruit: obconic, compressed; pappus of 25--45 long-barbed bristles in 1 series. Habit: Plant +- glabrous. Stem: < 21 dm, often stout, from short, branched caudex. Leaf: proximal largest, 5--25 cm, generally < 10 × longer than wide, entire, often +- fleshy, base nearly sheathing, distal-most sometimes scale-like or with axillary leaf-clusters. Inflorescence: panicle-like, generally club-shaped; heads generally many; involucre 2.5--4 mm, phyllaries very narrowly triangular, inrolled near tip, sharply acute, +- strongly graduated, outer 1/3--2/3 inner; midrib generally enlarged, translucent. Ray Flower: 3--13; ray 1--2.5 mm. Disk Flower: 10--20; corolla +- 3--4 mm. Fruit: 1--1.5 mm, +- strigose. Chromosomes: 2n=18. Ecology: Wet streambanks, springs, marshes; Elevation: generally < 2500 m. Bioregional Distribution: Teh, CCo, SnFrB (extirpated), SCoR, SW, W&I, DMtns. 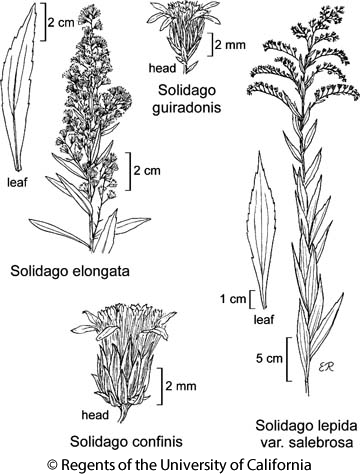 Flowering Time: Apr--Oct Note: Involucres of northern DMtns plants like those of Solidago spectabilis. Citation for this treatment: John C. Semple 2012, Solidago confinis, in Jepson Flora Project (eds.) Jepson eFlora, http://ucjeps.berkeley.edu/eflora/eflora_display.php?tid=4961, accessed on April 24, 2019. Teh, CCo, SnFrB (extirpated), SCoR, SW, W&I, DMtns. Markers link to CCH specimen records. Yellow markers indicate records that may provide evidence for eFlora range revision or may have georeferencing or identification issues. Purple markers indicate specimens collected from a garden, greenhouse, or other non-wild location.